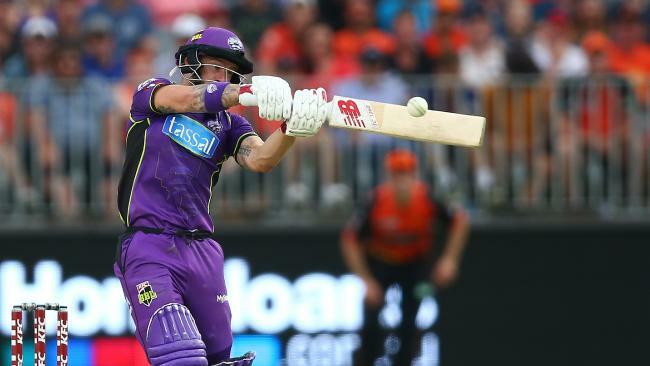 THE Hobart Hurricanes turned giant killer at Optus Stadium as they crushed Big Bash kings Perth Scorchers and powered into the final on Sunday­. It was a semi-final for the ages, the Hurricanes setting the men in orange a mammoth 4-210 chase and the home team had a massive fail in response, lights out for 139 off 17.5 overs. It was an amazing performance by a team that only fell into the finals after losing their last three games. The Hurricanes produced their best game of the summer, and their finals fling will continue against the winner of Friday night's semi between the Adelaide Strikers and Melbourne Renegades in Adelaide. 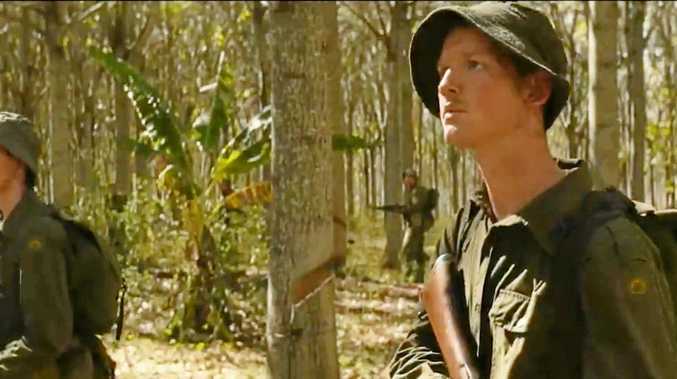 "That was our most complete game of the tournament so far," Canes captain George Bailey said. "We had to play our best game to beat the Scorchers - they have been so consistent and so phenomenal - and we matched them and surpassed them with bat and ball and in the field. "It was the complete game." The Hurricanes will stay in Perth to watch the Strikers and Renegades. "We had to put all our energy into this game," Bailey said. "You can't have even 1 per cent of you looking forward. The Scorchers deserve so much respect so to be honest I'm thrilled to be in it and thrilled to be playing our best cricket. "At the start of the tournament we spoke about peaking at the right time and hopefully we're doing that." Facing a batting attack that has ripped apart sides this season, the Hurricanes were bold in starting with forgotten all-rounder Tom Rogers and debutant Riley Meredith with the ball. Rogers was outstanding, taking 3-17 off his first three overs - the scalps of Michael Klinger (one off seven), Cameron Bancroft (one off six) and Shaun Marsh in a double-wicket third over. By the end of the seventh, spinner Clive Rose had sent Mitch Marsh (three off five) back to his seat and in the same over skipper George Bailey brilliantly ran out Ash Turner - Scorchers 5-57. Meredith joined the party in the ninth over when he claimed his maiden BBL wicket, the scalp of Perth captain Adam Voges (3 off 4). When Jofra Archer clean bowled Hilton Cartwright, the stadium started to empty. 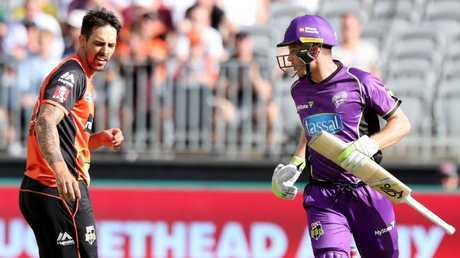 TWO batters were concussion-­tested, and needed helmets replaced, as the Hobart Hurricanes withstood a ferocious pace barrage from the Perth Scorchers at Optus Stadium to set the home team the highest semi-final run-chase in BBL history. 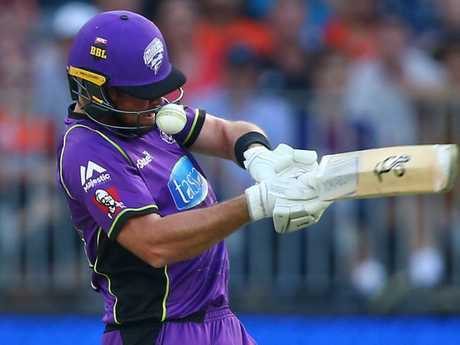 It was a masterclass with the bat for the Hobart Hurricanes - a dream innings in their first Big Bash semi-final since BBL03. The Cane Train steamrolled the best bowling attack in the comp­etition, which included smashing former Test gun Mitchell Johnson (0-43) for the most runs he has conceded this season. Johnson's previous worst was against the Hurricanes at the WACA two weeks ago. It was enough to impress Australian ODI legend Mike Hussey. "A lot of credit needs to go to Matthew Wade for he got the ­innings off to a rollicking start and what a finish by Dan Christian and Ben McDermott - they batted with a lot of power," Hussey said. 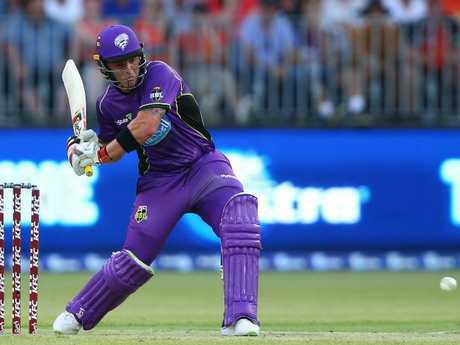 Going into the do-or-die match, the Hurricanes had every right to feel short-changed that Travis Head was released from Australian T20 duties to play for the Strikers against the Renegades on Frinight, but the Big Bash League's "sultan­ of swing" D'Arcy Short missed Hobart's date with the Scorchers. In the absence of Short, Wade opened for the third game in a row and put a blowtorch on the home team. He showed no respect to the Scorchers' fearsome attack as he blasted it all around the $1.5 billion stadium in front of 50,874 fans. Wade put on a masterclass opening the innings with Test keeper Tim Paine, who was an onlooker as his left-handed teammate went ­nuclear. Wade bashed 71 runs off 45 balls, including 10 fours and a six, and brought up his 50 off 31 balls in the eighth over, getting the Cane Train off to a brilliant start. When Wade went, Ben McDermott took up the slack, belting 67 off 30 batting with Dan Christian (37 off 21) to set a mammoth run chase.